For the the exhibition in the S.M.A.K., Partenheimer's conceptual point of departure has been La Robe des Choses, a text from A la Rêveuse Matière by the French author Francis Ponge. Reality is veiled, elusive. There is only one-way to fathom its depths: through thinking. Reflection results in concepts that enable us to penetrate and reconstruct reality. On the other hand, there will always remain elements from reality that elude pure reason and that can only be made visible by art. Partenheimer's work must consequently be interpreted as resulting from a coherent stream of thoughts, with which the artist does not so much want to reveal or evoke a certain reality, as to show us and discuss the reflections that accompany our 'being in this reality'. Quite often dogmas are undermined by new dogmas. That, precisely, is what Partenheimer seeks to avoid. 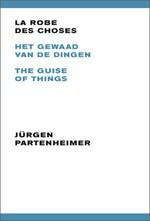 An image, in Partenheimer's view, is only interesting if it can constantly bring about new streams of ideas. The public is thus invited to create the image himself or herself according the artist's theory: 'All sculpture is essentially conceptual. It does not have a final, definite form or a fixed, spatial dimension. As a model, as a monument of the imagination, a sculpture assumes those dimensions, which it needs for the respective environment in which it is shown. Any work may be altered and its dimensions deliberately adapted to the place chosen for its showing, be it a geometrically architectural room or an open, natural space'.